Action Lab as a publisher is one that knows a thing or two about all-ages comics. Katie Cook is a creator who dabbles in the same sphere, which makes the recent news that they're joining up make a lot of sense for everyone. And it's not just a simple partnership; rather, Cook is bringing her famed webcomic Gronk: A Monster's Story to the publisher. "Gronk has always been a very personal project for me... I developed the character back in college YEARS ago and had always planned on doing something with her. It wasn't until I kicked myself in the pants and started the webcomic that I started in on the journey that became "Gronk: a monster's story"... a project that has seen me through years of my life. Every change my adult life has faced, leaving a comforting job for full-time freelance, becoming a mom (twice!) and more, I’ve always tried to get a Gronk strip up that week! It's my true "me" creative time every week. It's a strip that has grown with me as a person and a creator. " Cook said. Gronk tells the tale of a young monster who has turned her back on monsterdom (mostly because no one found her scary) and has become fascinated with humans. She moves in with her human friend Dale and her pets Kitty and Harli, a 160 lb. Newfoundland Dale wants to declare as a dependent to the IRS. Published weekly online since 2010, Cook has built up quite the following for her adorable bacon loving, pop culture obsessed creation. Cook, A Harvey Award nominated creator and fixture on the convention circuit built a career working on licensed properties like Star Wars and Lord of the Rings before landing the MLP series, based on the Hasbro toy line and cartoon series. She added "I've been approached before about taking my self-published books to another publishing "level", but it's ALE that, in the end, I trust to do it. It's a team that is made up of some of the nicest people I've gotten to know in comics and they really are trying to put together something special. I am thrilled to put Gronk (and myself) in their lineup. " Action Lab Entertainment President, Kevin Freeman said, "We're thrilled to have Gronk as a part of our line. Katie is an up-and-coming star in the industry with a passionate fan base. We're looking forward to a fantastic partnership." Cook will be exhibiting at the 2014 edition of New York Comic Con in Artist Alley table C-10. She will also be signing a special limited edition issue Gronk: A Monsters’ tale at Action Lab Entertainments’ Booth #3044 on Friday, October 10th and Sunday, October 12th from 1-2:00 PM. NYCC 2014 EXCLUSIVE: MY LITTLE PONY'S KATIE COOK COMES TO ACTION LAB! Popular writer/artist brings her webcomic, Gronk, to the fastest growing publisher in comics. PITTSBURGH, PA- She's written and drawn everything from Star Wars to Marvel. Now Katie Cook, the popular writer of IDW's My Little Pony: Friendship is Magic brings her creator owned webcomic, Gronk: A monsters story to Action Lab Entertainment. Cook will be exhibiting at the 2014 edition of New York Comic Con in Artist Alley table C-10. 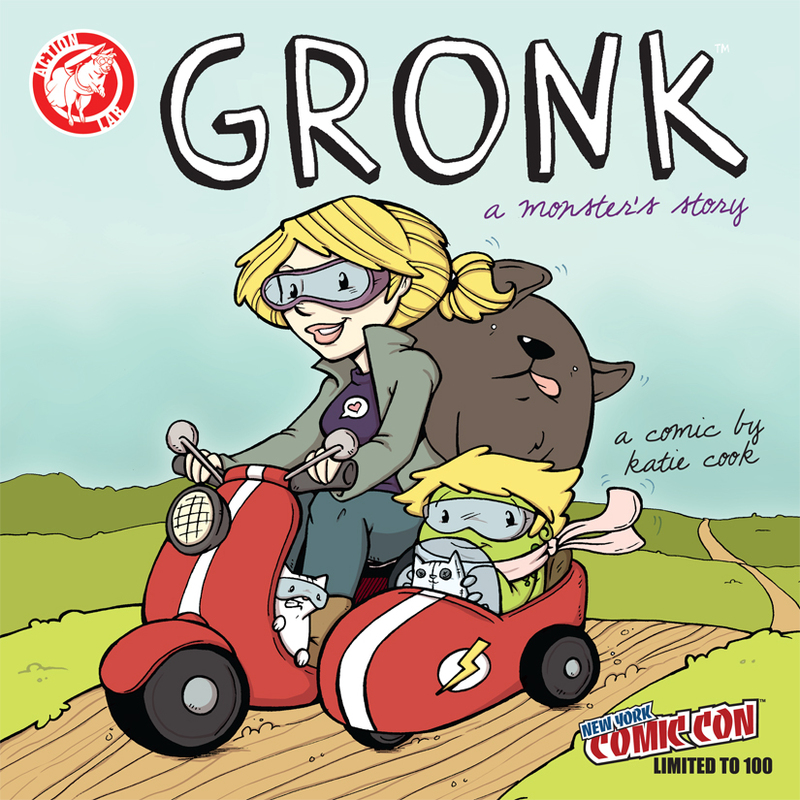 She will also be signing a special limited edition issue Gronk: A Monsters’ tale at Action Lab Entertainments’ Booth #3044 on Friday, October 10th and Sunday, October 12th from1-2:00pm.